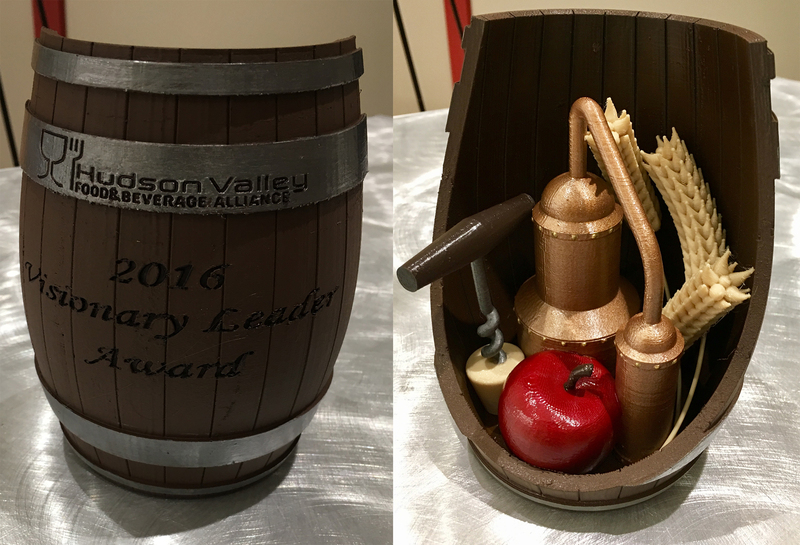 The Hudson Valley Advanced Manufacturing Center (HVAMC) at SUNY New Paltz lent its talents to the recent Hudson Valley Beer, Wine, Spirits & Cider Summit, in the form of an original 3D printed award trophy. The Hudson Valley Food & Beverage Alliance (HVFBA) presented its 2016 Visionary Leader Award to Sam Filler, director of industry development for Empire State Development Corporation, and soon-to-be executive director of the New York Wine & Grape Foundation. The HVAMC design and manufacture work was one of two New Paltz contributions to the HVFBA’s 4th annual Summit; food marketing Lecturer Russell Zwanka attended and led a breakout session on “Crafting Connections,” drawn from his years of experience in the food and grocery industry.